If you have been following me for some time, you would know that I recently started playing in the highlight and contouring game. Like many, I am poor. So when I see a nice palette that HAS EVERYTHING I need to complete a makeup look, I am willing to splurge or ask for as a gift. 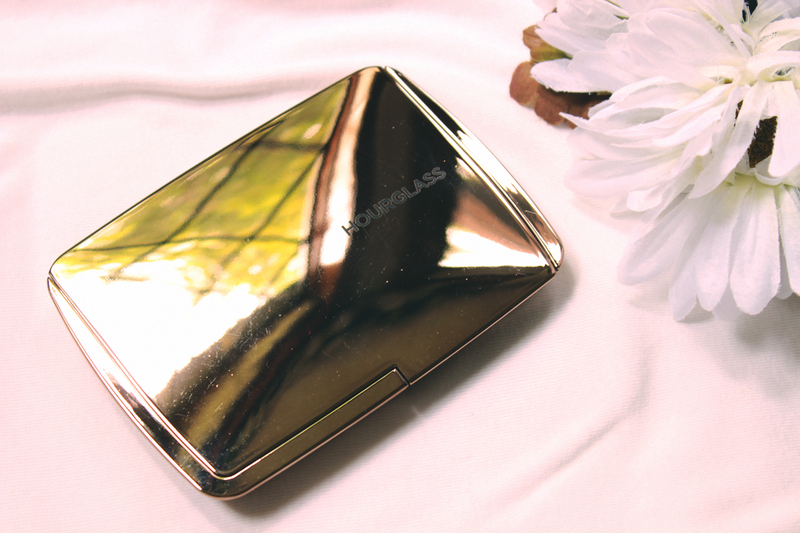 I received the Hourglass Ambient Lighting Edit (link) as a gift from my sister on my 18th birthday. I was so excited to receive this product because it is not cheap and easy to get. It costs $80.00 and is only available during the holiday season. Luckily for me, my birthday is a little after the holiday season, so Sephora had leftovers. Starting with packaging, this palette comes in the standard Hourglass metallic copper finish with Hourglass etched in a chocolate brown all in caps. 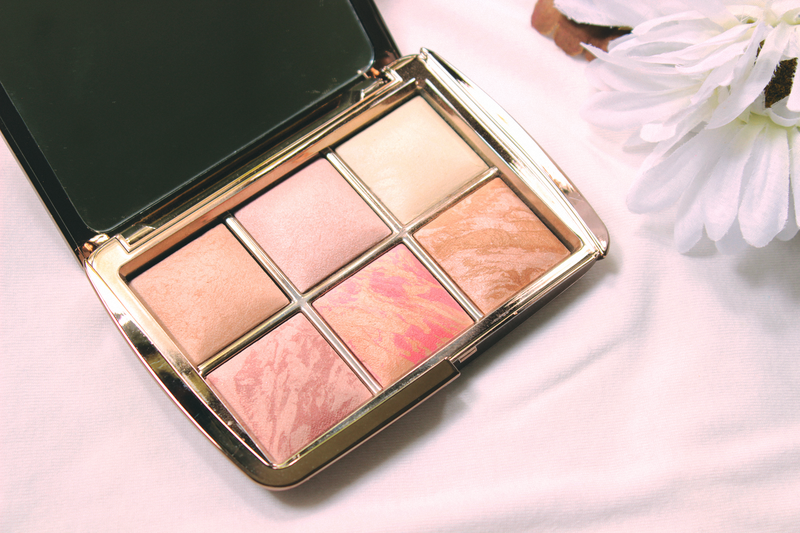 As you open, you are greeted with a large mirror and six smaller sizes of powder makeup Hourglass offers. We have three ambient lighting powders, two ambient blushes, and one ambient bronzer. Ambient Lighting Powder: Diffused Light // A sheer face powder that adds a translucent glow to the face. Has a blurring effect and a satin finish making it a photo friendly product. Ambient Lighting Powder: Iridescent Light // A cool-toned powder that contains very fine glitters to give a reflective look to the skin. Shimmer finish. Ambient Lighting Powder: Dim Light // A light pale-yellow powder. Has a satin finish. 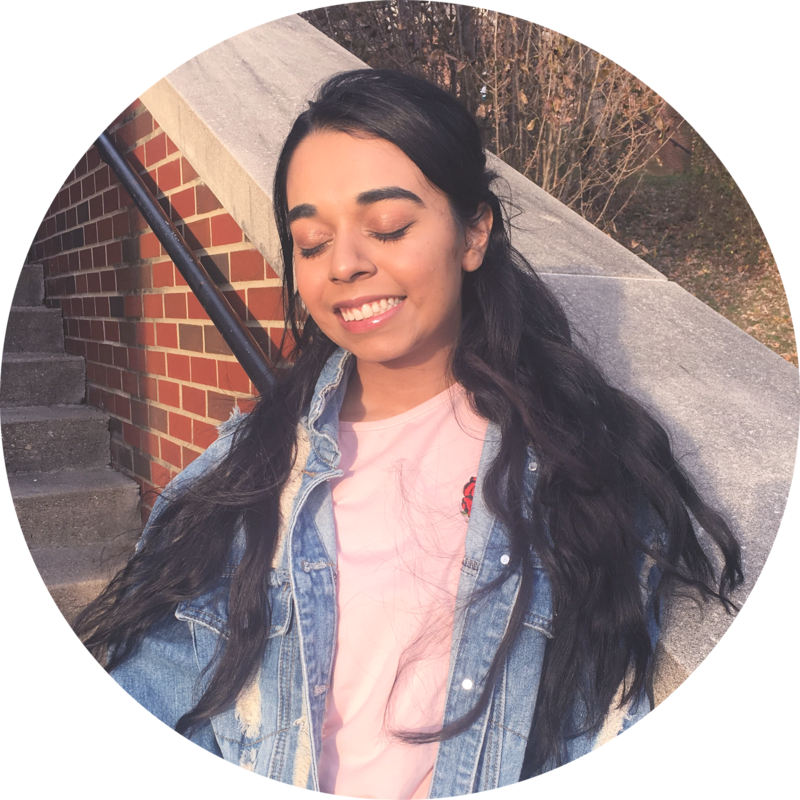 Ambient Lighting Blush: Mood Exposure // A more cool-toned brownish-mauve blush. Ambient Lighting Blush: Luminous Flush // More vibrant coral-pink blush. Ambient Lighting Bronzer: Luminous Bronze Light // A medium tan colored bronzer with very fine glitters. (Top to Bottom, or Right-most to Left-most) Diffused Light, Iridescent Light, and Dim Light. (Top to Bottom, or Right-most to Left-most) Mood Exposure, Luminous Flush, and Luminous Bronze Light. I want to talk about the blushes and bronzer before I get into the powders. 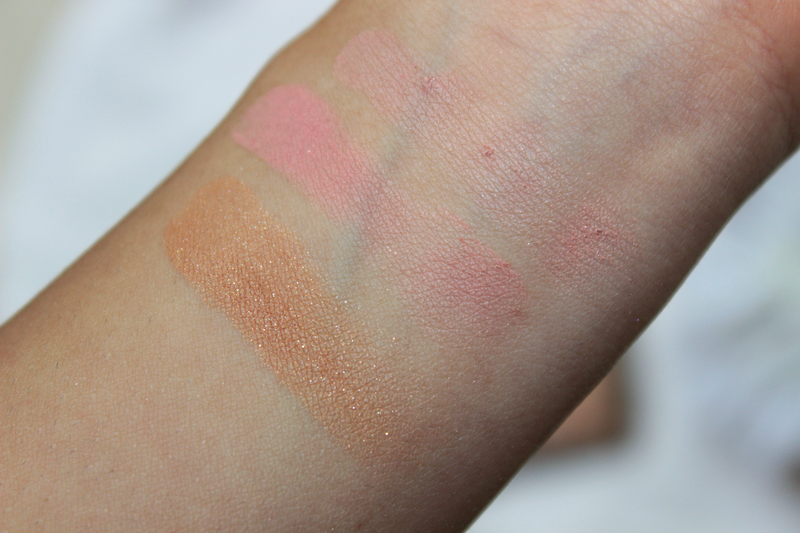 Starting off the Ambient Lighting Blushes are very pigmented and very wearable. I really like the two color choices in the palette because they are both very safe and can go with almost all makeup looks. As for the Ambient Lighting Bronzer, I am not much of a fan. 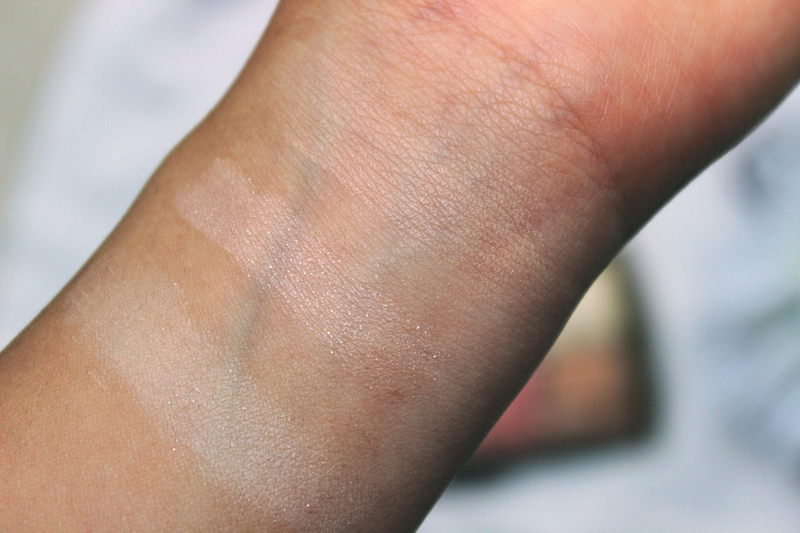 I only every use bronzer for shading and I tend to stick to a dark matte shades because I am quite tan. This shade is more suitable for people with lighter skin tones, but with being said, I would not suggest it with contouring and shading. It has a plethora of fine glitter particles that are not ideal for what people usually use it for. Now, this brand is most known for their Ambient Lighting Powders and after trying them, I can see why. I want to start with Dim Light since it is the one I don't use often. I do like it as a setting powder for my under eyes and as a slight skin brightener when I am looking a bit dull. As for Iridescent Light, I don't have much experience with powder highlighters, except for Mac's Soft-n-Gentle, and yes, I have not gotten on the Champagne Pop Grind. I really adore Iridescent Light! It is more cool toned which makes me a bit nervous because of my warm toned skin, but it works beautifully. It has a nice balance of a shimmer finish and glitter particles making it an ideal highlighter. Finally, Diffused Light is probably my favorite from the palette. It is all around face powder. It has a unique satin finish that reflects lights and adds a soft finish to the skin. Prior to trying this color, I was very skeptical, but it lives up to the hype. Overall, I really enjoyed this palette. It gave me a good look into what Hourglass has to offer. This is a special edition palette, but I am very certain it might be available in a few Sephora stores in the back and will be making its return during the holiday season. It does have a heavy price tag, however, if you are makeup crazy I highly suggest getting it. As for now I know I will be repurchasing the blushes, iridescent light, and of course, diffused light when I hit pan. 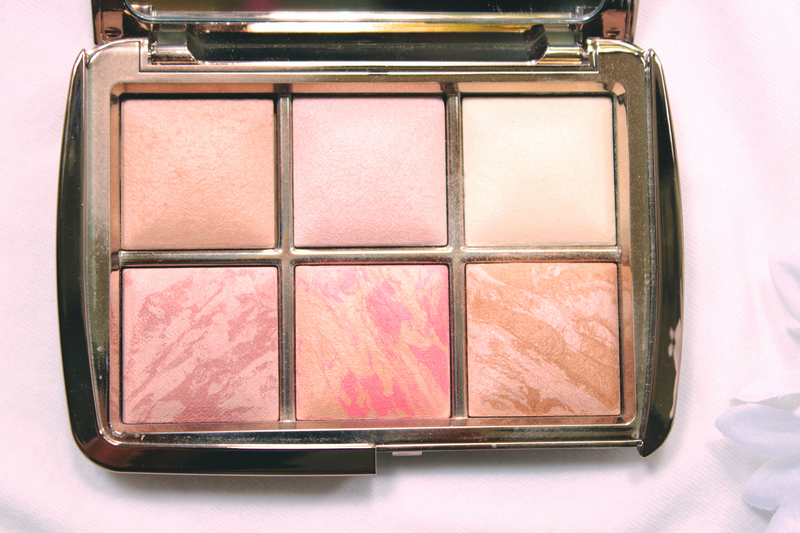 What are your opinions on Hourglass and this palette?